Ideal for making a standard 235ml mug of tea. Simply fill the tea swizzle with your favourite full leaf tea, slide on the cover, place in a mug of hot water and ‘swizzle’ away! The tea swizzle is a quick, easy and convenient way to brew loose leaf tea. It can be used anywhere and is the perfect device for travel. It is small, compact and made from sturdy stainless steel which makes it the perfect brewing device to take on the go. This product has been designed and manufactured by La Cafetiere, which shows the sheer quality of the device. La Cafetiere have been creating brewing accessories for over 50 years and continuously provide us with innovative designs. They only use the best materials, such as premium stainless steel. Not only does this mean high quality brewing, but it will also allow the product to last through many uses. The La Cafetiere Tea Swizzle is easy to clean and store which makes it a simple solution to luxurious loose leaf brewing. What does a tea infuser do? An infuser is a device which aids in brewing. It plays a similar role to a tea bag as it provides a barrier where the water can infuse with the tea. The biggest difference is that infusers aren’t made from paper as they are usually made from sturdier materials such as metal or plastic. Infusers aren’t for one-off use like bags are, they are reusable items that should provide many years of brewing. Place the loose leaf tea into the swizzle. As a rough guide use one scoop of loose leaf per cup. Boil the kettle and allow the water to cool for a couple of minutes. Place the swizzle in your cup and pour the hot water over it. Brew for however long is necessary. Black teas only require a couple of minutes, where as a fruity blend will require longer. Simply take the swizzle out, sip and enjoy! It is very important to clean the brewing device after every use. We recommend this to maintain hygiene and make sure you’re getting a build up of drink residue. Silicone and stainless steel are the most popular materials for infusers. This is mainly because they are resilient materials that can withstand very high temperatures. Both will brew your tea in a very similar way and there will be no detectable difference in taste. The main thing to consider when choosing between silicone and stainless steel is the look and feel of the materials. Stainless steel looks professional, modern and sophisticated. It is favoured for its clean and shiny look and has a feel of luxury. Silicone can be perceived as a cheaper looking material, due to the plastic look and feel. 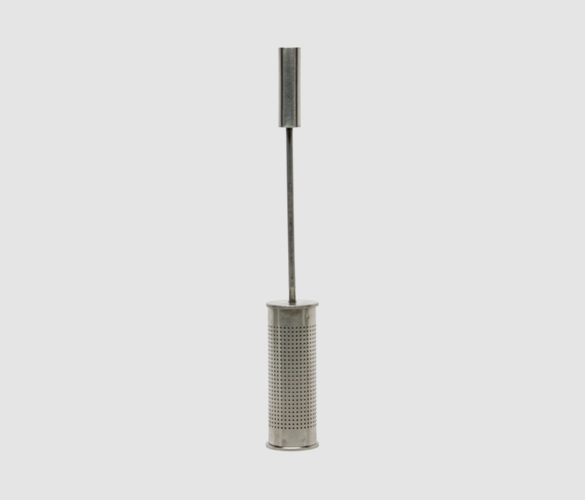 The tea swizzle is made from premium stainless steel which is ideal for its easy cleaning and high resilience, meaning it will last you a very long time.